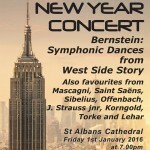 "SASO gets 2016 off to a flying start for audience"
After more than three decades St Albans Symphony Orchestra’s annual New Year’s Day concert has become one the biggest musical events of the year for the city. 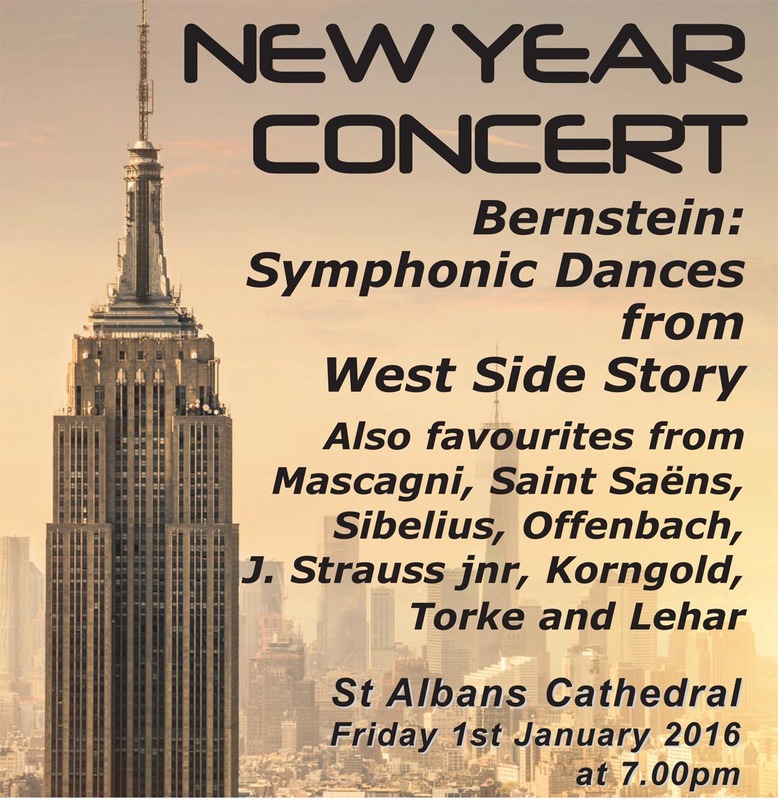 And the 2016 concert at St Albans Cathedral was no exception as a packed audience was treated to a rich programme of old favourites and interesting less well-known musical works. Currently without a permanent conductor, the man in charge of the orchestra for the impressive programme was Tom Hammond who is regular conductor of the Hertford Symphony Orchestra. From the start with Saint-Saens’ rousing Bacchanale from Samson and Delilah it was obvious that the orchestra was on form and working well with its guest. And the good work continued with Mascagni’s Intermezzo from Cavalleria Rusticana and Sibelius’s beautiful and haunting Valse Triste. But the outstanding work of the entire evening was Leonard Bernstein’s Symphonic Dances from West Side Story. Although an absolute delight for the audience, the set of nine dances are a massive challenge for the orchestra with their ever-changing moods and rhythms as well as very tricky timing as partial phrases are passed from one instrument to another. The performance was an outstanding success with dazzling solo performances from individual members of the orchestra and a rich balance of sound with good, clean rhythms. Czech-born composer Eric Korngold is best known for his many film scores and the music for Sea Hawk, the 1945 film starring Errol Flynn, opened the second half of the concert followed by Michael Torke’s Javelin, a piece commissioned by the Atlanta Committee for the 1996 Olympics. The orchestra holds a retiring collection in aid of charity at the end of each New Year concert. This year it raised £1,218.60 in aid of Peace Hospice Care and Macmillan Cancer Support in memory of orchestra members June Martin and Mike Brian who both died recently.